Tag line: "They Used Every Passion In Their Incredible Duel!" 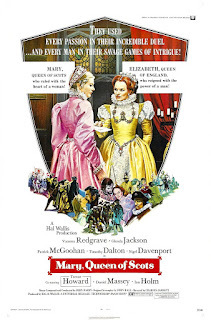 From producer Hall B. Wallis, the man behind both Becket and Anne of the Thousand Days, comes 1971’s Mary, Queen of Scots, a movie as grand in scope as its predecessors, and featuring an all-star cast that brings its historic power struggle convincingly to life. Soon after the death of her husband, the King of France (Richard Denning), Mary Stuart (Vanessa Redgrave) returns to her native Scotland to assume her rightful place as that country’s monarch. But Scotland has changed since she’s been away; for one, the Protestant beliefs that have taken hold in England have also spread north, causing friction between the Scottish nobles (some of whom have embraced the new faith) and the church in Rome. In addition, Mary’s half-brother James (Patrick McGoohan) has been ruling Scotland in her absence, and has no intention of completely surrendering his power. More than anything, though, the Catholic Mary faces opposition from her cousin, England’s Queen Elizabeth I (Glenda Jackson), due mostly to Mary’s insistence that she, and not Elizabeth, is the true heir to the British throne. With several envoys from Rome, including courier / musician David Riccio (Ian Holm), to advise her, Mary stands against those who challenge her power. But as Mary deals with the treachery in her own court, Elizabeth is busy plotting Mary’s downfall. The British Queen orders her stable master (and lover) Robert Dudley (Daniel Massey) to travel north, where he will present himself as a potential husband for the widowed Mary. But at the same time, the wily Elizabeth also sends her Catholic cousin, Lord Darnley (Timothy Dalton), to Scotland, knowing full well that Mary will prefer him to the Protestant Dudley. Ignoring the advice of her brother and many Scottish nobles, Mary does, indeed, marry the weak-willed yet egotistical Darnley, a move that eventually plunges the country into civil war. As Mary and her chosen guardian, Lord Bothwell (Nigel Davenport), try to maintain control of Scotland, Elizabeth waits patiently in England for the day that Mary is finally deposed. But will Mary succumb to the pressures and abdicate, or will the son she bears, fathered by Darnley, fulfill the childless Elizabeth’s deepest fears by one day sitting on the thrones of both England and Scotland? Filled to its brim with political intrigue and backdoor dealings, Mary, Queen of Scots has quite a bit going for it, starting with its extraordinary cast. Vanessa Redgrave is predictably superb as the naïve yet determined Mary, whose trusting nature is constantly getting her into trouble (her impulsive marriage to Darnley causes more problems than she ever imagined, and leads to a shocking turn of events that threatens to bring her reign to a disgraceful end). Equal to Ms. Redgrave in every way is Glenda Jackson as Elizabeth, who, despite being the more experienced of the two monarchs, lives in fear of losing her throne to the younger Mary, who has formed an alliance with the church in Rome. While it’s clear early on that Elizabeth is the better tactician, both women are strong in their own way, and prove formidable foes. The film’s supporting cast, including Nigel Davenport (the confident Bothwell), Timothy Dalton (the duplicitous Darnley), and Ian Holm (Mary’s loyal friend, Rizzio), is also impressive, but it’s the showdown between the queens that gives Mary, Queen of Scots its dramatic punch. Along with the fine work of its two stars, Mary, Queen of Scots boasts excellent costumes (designed by Margaret Furse, who won an Academy Award for Anne of the Thousand Days) and makes great use of several locations throughout England and Scotland (such as Parham House in West Sussex and Hermitage Castle in Newcastleton). Then there’s the Oscar-nominated score composed by John Barry, which incorporates plenty of period music from the 16th century (Barry’s score for Mary, Queen of Scots ranks as one of his finest, and for the man who composed the music for Midnight Cowboy and such early Bond films as Goldfinger and Thunderball, that’s high praise indeed). The struggle between Mary and Elizabeth has been brought to the screen many times over the years. In 1895, Thomas Edison produced the 18-second short The Execution of Mary Stuart, which some believe marked the first use of cinematic special effects; and even John Ford, master of the American West, tackled the story in 1936’s Mary of Scotland, which featured the indomitable Katherine Hepburn in the title role. 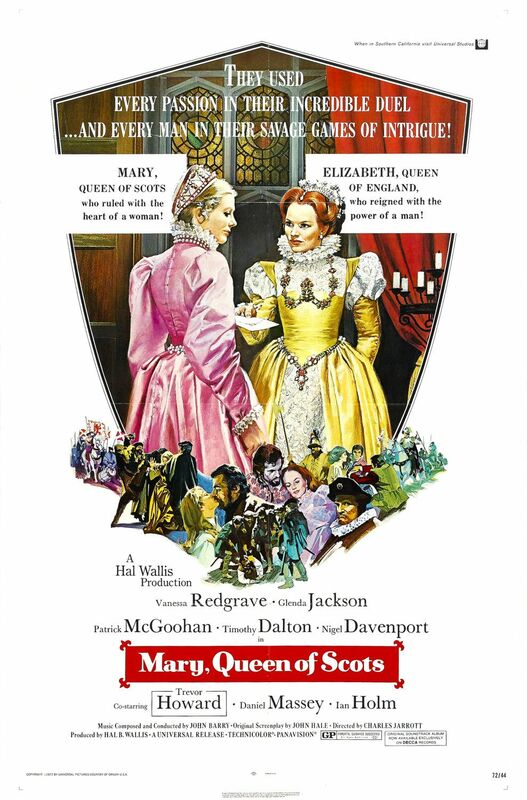 But of all the versions I’ve seen, Mary, Queen of Scots is far and away the best.